Riverside just continues to impress. The five-time defending state champion Warriors claimed another notch in their belt with a 52-86 victory against Hillgrove in the International Girls division at the Eye Opener held on Saturday at the Roger Milliken Research Center in Spartanburg (See venue rankings). The win is the Warriors' fourth consecutive in the meet. The Warriors were led by Jessie Crowley, S.C. no. 3, who finished as individual runner-up with a time of 19:21.60. Hillgrove's Grace Ellsworth was medalist by posting a time of 18:47.60. Eastside's Olivia Henn (19:42.90) placed third, followed by Hillgrove's Nicole Franklin (19:46.80) and Greer's Taylor Houston (19:49.20). Riverside placed five runners in the top 16 finishers. Katherine Rogers was ninth, while Elizabeth Rogers finished 12th. Laura Macgregor placed 14th, and Kayla Harris was 16th. J.L. Mann placed third in the team standings with 136 points, followed by Dorman (156) and Wade Hampton (160). In the International Boys race, Greer's Coen Roberts (S.C. no. 1) took home the title placing a time of 15:46.70. He edged Christ School's Andrew Hammel, who finished at 15:49.10. Hillgrove's Noah Hayes (16:00.40) was third, Boiling Springs' Kade Gosnell (16:18.80) and Christ School's Joseph Visconti (16:22.80) placed fourth and fifth, respectively. Eastside won the team title with a 102-110 victory against Hillgrove. Hillcrest (162) was third, followed by St. Joseph's (190) and Wando (215). The Championship Girls race was taken by Nation Ford's Katie Pou (S.C. no. 1), who finished at 18:57.70. Greer Middle College's Morgan Summey was runner-up with a time of 19:30.16. Mauldin won the team title with a 158-177 decision against Wren. 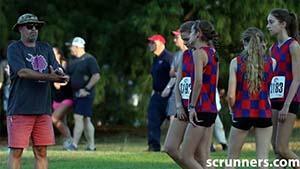 Waccamaw, Nation Ford and Charlotte Catholic finished third through fifth, respectively. River Bluff took the Championship Boys team title with an impressive 117-216 decision against North Henderson. Morristown-West placed third, followed by Byrnes and Asheville. Philip Simmons' Noah Ward earned individual medalist with a time of 15:57.50. North Henderson's Hunter White (16:33.00) was runner-up. Next up: Runners have the chance to preview the SCHSL state meet course Saturday with the Bob Jenkins SCTCCCA Coaches Classic.